Includes one wig styled as a colonial aristocrat lady. Wig is available in white. The wig features an elastic band on the inside for comfortable one size fits most sizing. 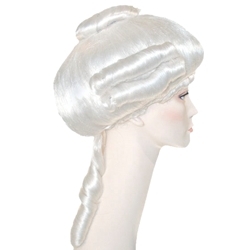 The colonial aristocrat lady wig features a long white wig that has been pulled into a ponytail, with a bun on top, and 2 barrel curls on each side. This wig can be used for a number of different characters including Martha Washington, Betsy Ross, as well as other colonial period women.